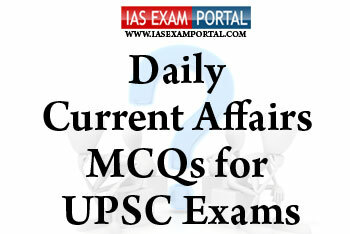 Current Affairs MCQ for UPSC Exams - 11 April 2019 | IAS EXAM PORTAL - India's Largest Community for UPSC Exam Aspirants. 1) The “blackhole” refers to a point in space where matter is so compressed as to create a gravity field from which even light cannot escape. 2) The more mass the smaller will be the black hole due to high compression. 3) The supermassive black holes which lurk in the centres of galaxies could be the most luminous objects in the universe, claims scientists. Q2 . The controversial finance bill 2017 had provisions to amend which of the following tribunals in India ? Q3. India has built a 25-bed maternity hospital in Nepal. The hospital has been built under the Government of India's Small Development Projects Scheme.Which of the following statements regarding the scheme are true ? 1) Nepal's Finance Ministry would vet projects listed by provincial and local governments and then forward them to India for potential funding. After India approves the selected projects, it must sign financing agreements with the Finance Ministry to fund them. 2) The Indian grant will not be part of budget for the fiscal year 2019-20since thesegrants are based on mutual goodwill gestures and to expand mutual cooperation. 3) Currently the Indian Embassy gives grants to various projects at the local level including schools, colleges and hospitals under the SDP. Q4. Which of the following statements regarding the Payment and settlement scheme in India are true ? 1) The PSS Act, 2007 provides for the regulation and supervision of payment systems in India and designates the central government as the authority for that purpose and all related matters. 2)Under the act a “Payment obligation” is defined as what is owed by one participant in a payment system to another such participant which results from clearing or settlement or payment instructions relating to funds, securities or foreign exchange or derivatives or other transactions. 3) As per RBI’s latest circular all system providers in a settlement shall ensure that the entire data relating to payment systems operated by them are stored within India. Q5. April 13th 2019 marks the 100th anniversary of which of the following historical events in British India ?